Midwest All-Around has been postponed! 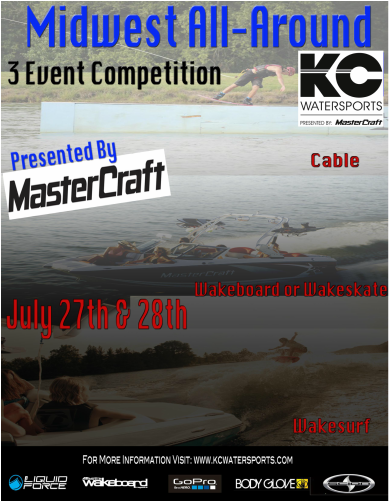 Midwest All-Around presented by Mastercraft is a three-event wakeboard & wakesurf competition that will be held at Miola Lake in Paola, Kansas and at KC Watersports. Riders of skill levels from beginner to pro will compete in the three disciplines of Boat, Wakesurf, and Cable. In each division, an overall winner (participated in all 3 disciplines) will be awarded. Registration for all riders will be held on Friday night before the event and on the day of the competition. Register before the competition begins at 7am on Saturday and 9-10am on Sunday. ·Air Tricks: Ollie 180 and 360 both front side and backside. One Air Trick (Only: Railey, Roll, Roll to Revert or Krypt) can be done in the run. Boat: This division is open to riders of any age who are not yet doing inverts. Riders in this division are typically doing 1 wake jump, surface tricks, and working on wake to wake jumps. Boat: This division is open to riders who are beginning to do inverts. Riders in this division are typically doing wake to wake jumps, 180’s and are working on landing their first inverts and spins. Boat: This division is open to riders who are not doing more than 5 inverts in a run. Riders in this division have multiple inverts and are doing spins. Boat: This division is open to riders who are doing more than 5 inverts. Riders in this division are typically grabbing inverts, doing mobes and spinning more than 360 degrees.